If you have any items that you think other CS/Quanta owners might be interested in, send the webmaster some photos and relevant selling information. Same goes for things you might be looking for. Farfetch. CS 36T shoal draught. 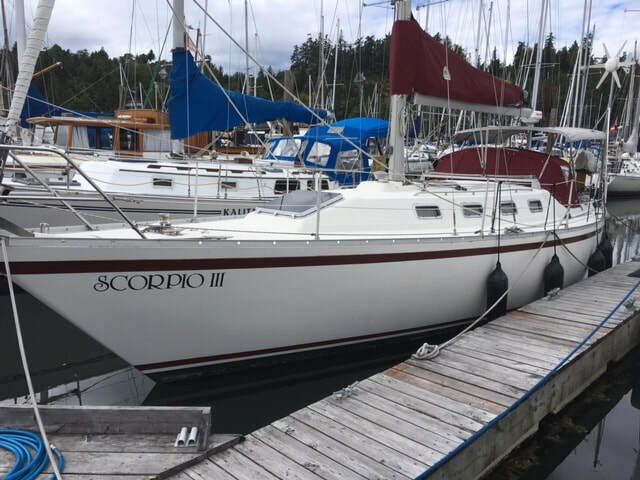 In December 2016 this boat was appraised as above average and priced at $65k. Since then I have experienced both a stroke and then a heart attack. 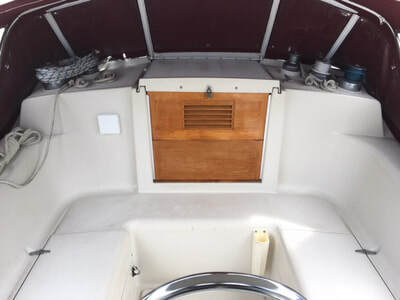 As much as I love this boat I am no longer able to do the work it requires to keep it in top condition. Westerbeke 33 diesel. Run time 2302 hours. Engine was rebuilt around 1600 hrs so run time since overhaul is approximately 700 hours. Recent heat exchanger overhaul and rebuilt raw water pump and some new cooling hoses as required. After market perko fuel filter. New engine instrument panel installed. Fuel Tank 35 gallon. stainless steel. Spare campbell sailor prop. Spare two blade bronze feathering prop. High output alternator 110 amp with Xantrex 84 regulator. Trojan T105 x 4 new two years ago. Engine battery tested at the same time was still good. Shore power receptacle changed to smart plug. two cables x 50 ft.
110 volt 40 amp Xantrex multi mode with remote monitor panel. Xantrex battery monitor at nav station. ALL overhead light fixtures are LED, the galley and nav station lights are red/ white selectable LED. Most reading lights are LED bulbs. 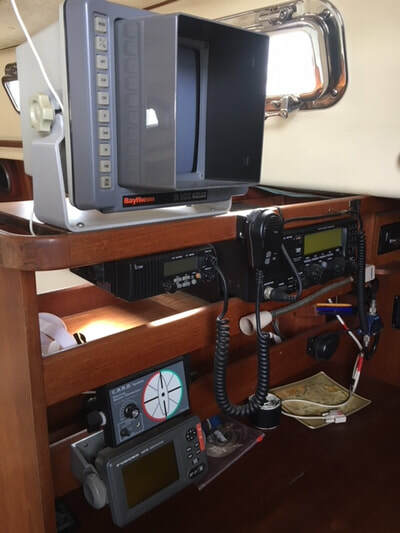 Uniden VHF DSC radio with remote wireless mic and gps hookup. 2 x 5 watt handheld radios. Three FRS radios with chargers. speed, depth sounder, relative wind. Twin 8lb propane bottles re-certified two years ago. Three burner propane stove with oven. Propane sniffer at floor level in galley. Electric propane shutoff solenoid. 1 CQR 35lb anchor with 120 ft 5/16 chain rode spliced to about 80 ft of rope rode. chain marked at 25ft intervals with coloured tie wraps. Separate 200 ft rope rode. 1 Danforth type anchor with about 100 ft rope rode. 500ft 3/8 stern tie line on spool. Price reduced to $ 36,000 as is. dodger is made from Top Gun fabric and has Lexan windows in front that are zipped in and detachable if desired. The centre panel can be folded backward and snapped in the open position. The bimini has an 18 inch clear panel with cover to aid vision while sailing with the bimini up,There are clear side and rear panels that zip onto the bimini and dodger to form a complete enclosure. Mesh screen side panels and one centre front panel enable insect protection if desired. mesh shade curtains for the rear of the bimini are included. 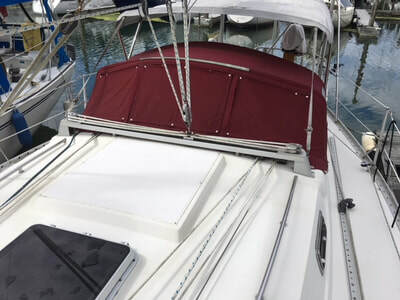 Mainsail with Doyle cradle cover and lazy jacks set up with fastenings for a Harken mast track system using ball bearing slides. Harken Mk IV unit 2 furler. Newer 100% jib cut with high clew for visibility. Older main sail with sock (snuffer) needing attachments for the harken slide track. Garhauer slide cars with ball bearing slides, controllable from the cockpit. Forward berth has custom made two piece mattress with fitted bottom sheet. The original cushions with insert are also included. Custom made teak cabinets in Forward berth . 4 inflatable life vests, 2 auto inflate. Original stanchions for the boat. Spare portlight lenses and seals. Owned and maintained by the present owner for 14 years. Extensively equipped for long distance or offshore cruising. 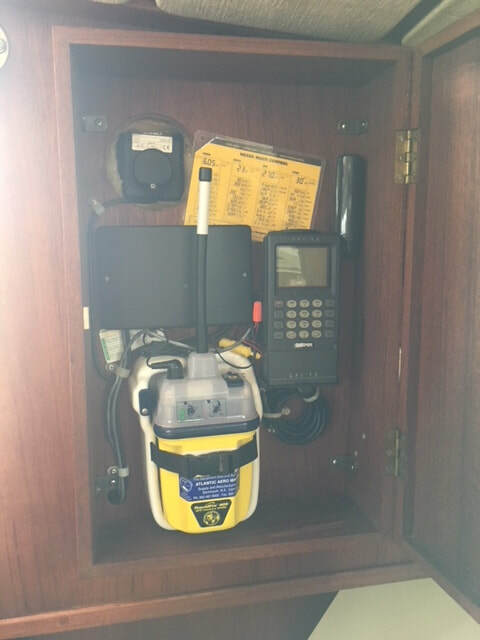 Cruising equipment includes Spectra water maker, Rutland 913 wind generator, Icom 710 SSB/Ham radio with Dynaplate ground and antenna tuner, E.P.I.R.B with GPS for position, wire luffed storm sail that attaches to an inner chain plate for heavy weather, Zodiac life raft (uncertified), high output alternator and 4 Trojan T-105 batteries new last year. Upgrades include 8 opening stainless steel "New Found Metals" port lights, stainless ventilator, Doyle sail pack and “Natty” dodger that were recently replaced. 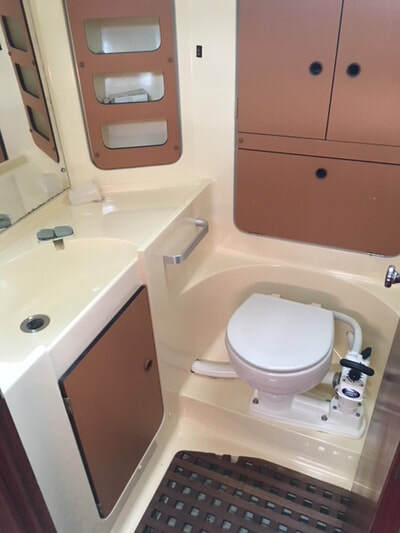 Bimini needs replacing. 3 blade Max Prop. Hot/cold cockpit shower. 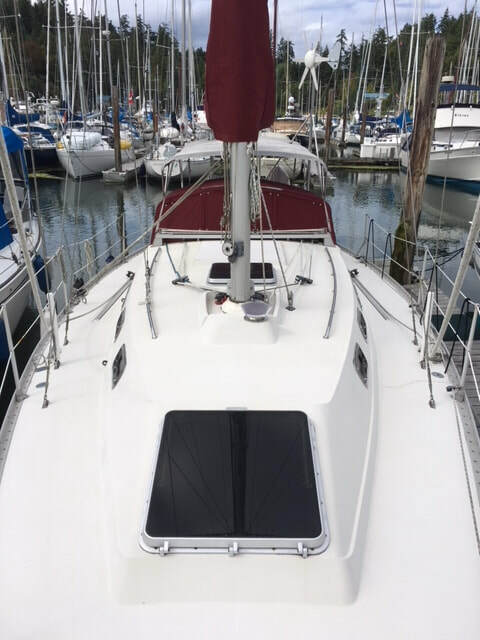 All lights upgraded to LED except for bow/stern navs. 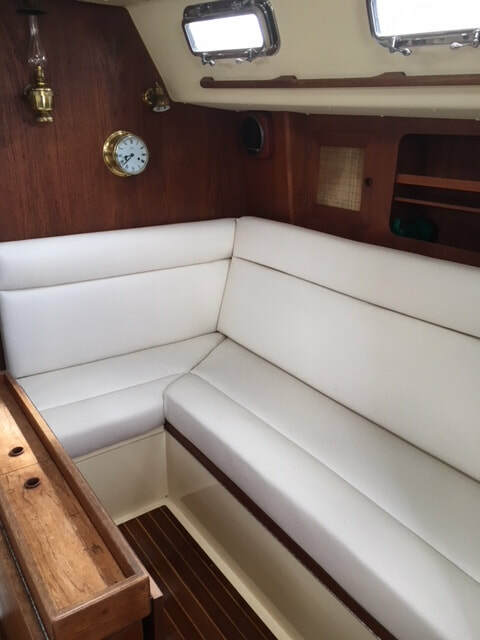 All interior upholstery new this year. Lots of spares including complete raw water pump and extra impeller/seals and entire spare refrigerator system. Also included are an Avon Roll Away hypalon dinghy with a new (9 hr.) 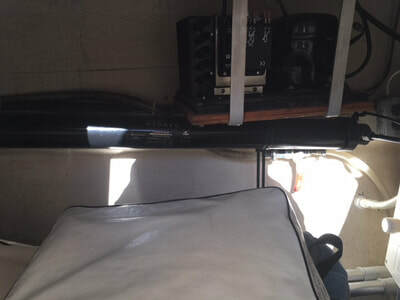 21/2 hp Suzuki outboard and all original owners manuals, wiring diagrams, etc. Please see attached specs/equipment list and photos. 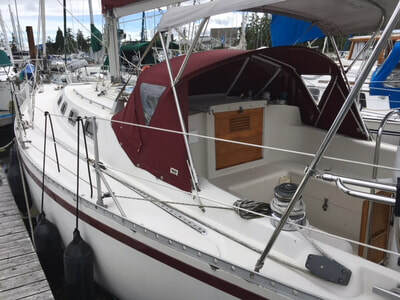 Asking $59,900 Can./ $45,600 U.S.
2nd Garmin 75 G.P.S. wired to E.L.T. for position info. 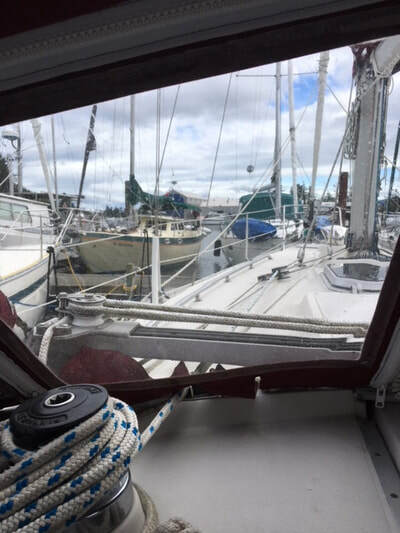 Small wire luffed storm jib that attaches to inner chain plate on foredeck and hoists with spare halyard for heavy weather. 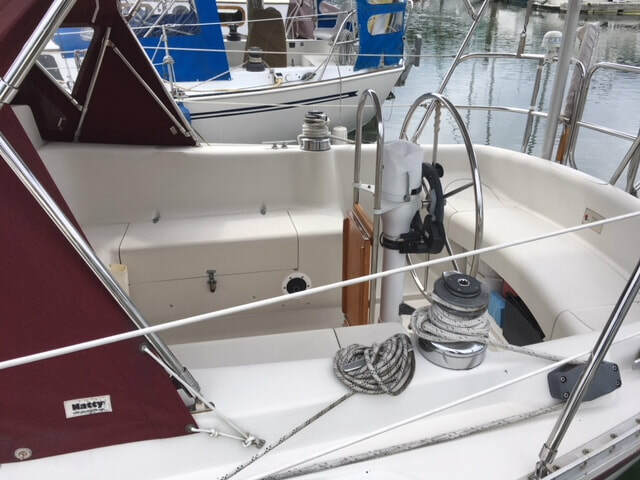 Spinnaker with pole and gear barely used. Spectra Santa Cruz water maker makes approximately 14 gal/hr. 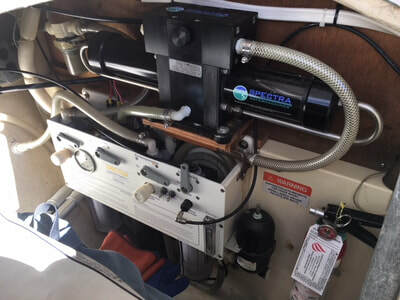 All cabin lights and masthead anchor light converted to L.E.D. 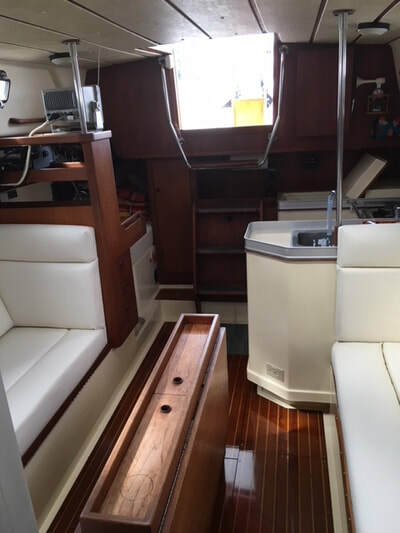 Lofrans Project 1000 Plus stainless steel electric windlass with foredeck controls and cockpit control for short handed anchoring. 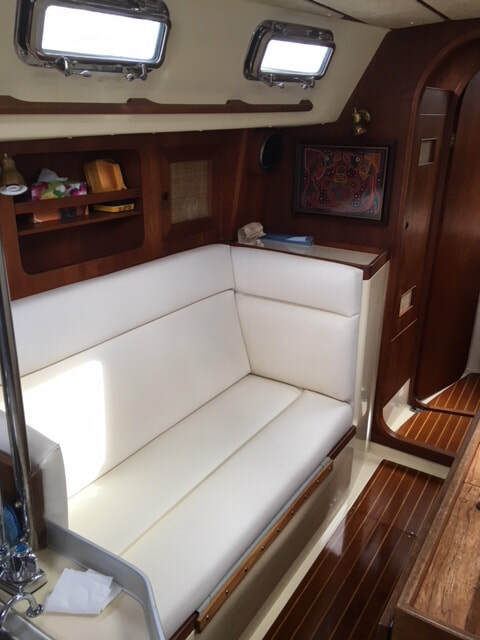 All interior upholstery is new with cream colored leatherette and new UC 45 foam. Memory foam also in V-berth. Complete spare raw water pump plus spare impellers and seals. As CS owners likely know, the Quanta 28s were designed by Ray Wall. He was part of a small firm which built 12 of them in Richmond BC in 1986-88, and still owns one of them. 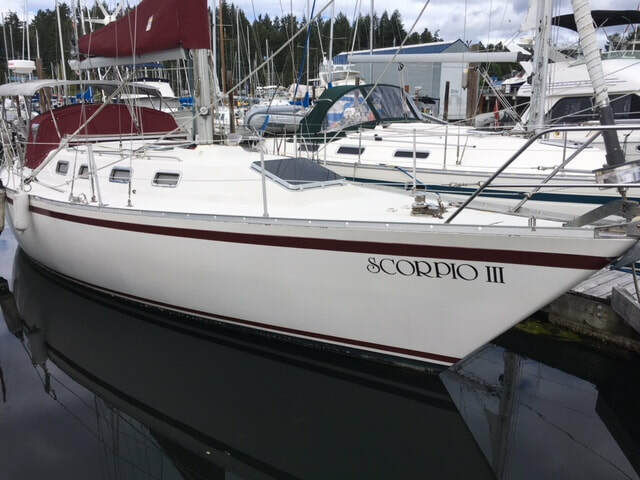 This boat is number 12, the last one made. I understand it was commissioned in 1988. This is the model with a chart table. 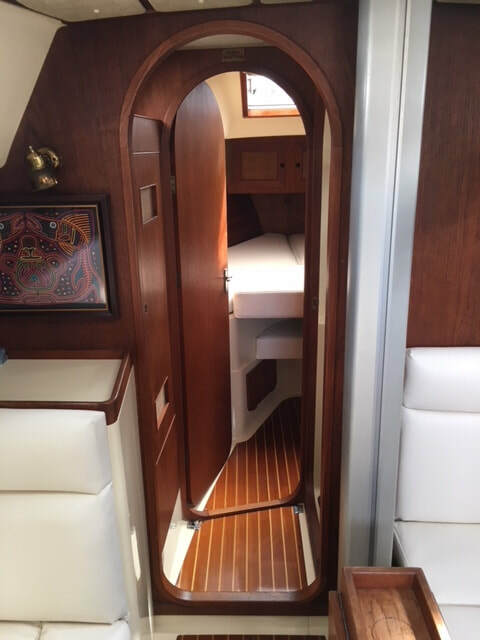 There are bunks for three adults (2 in V-berth, one in cabin). I have owned the boat since 2010 and have made a made a number of additions and upgrades. 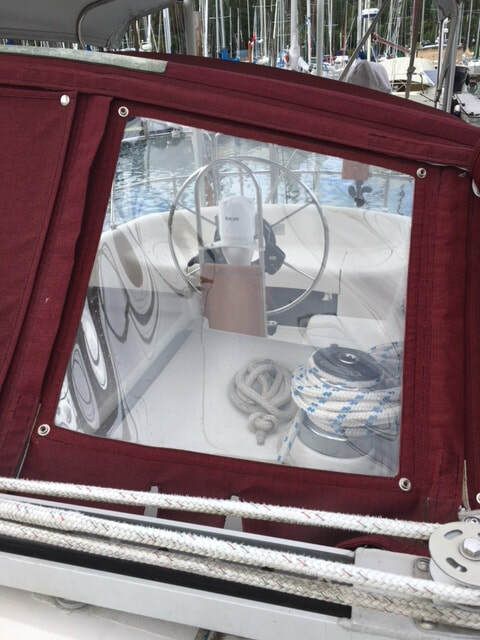 A Highfield HRIB 240 dinghy, only three years old, is also available. 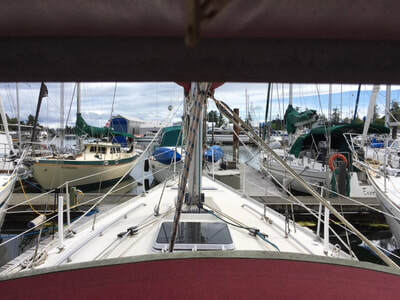 Lazy jacks Whisker pole mounted on mast. 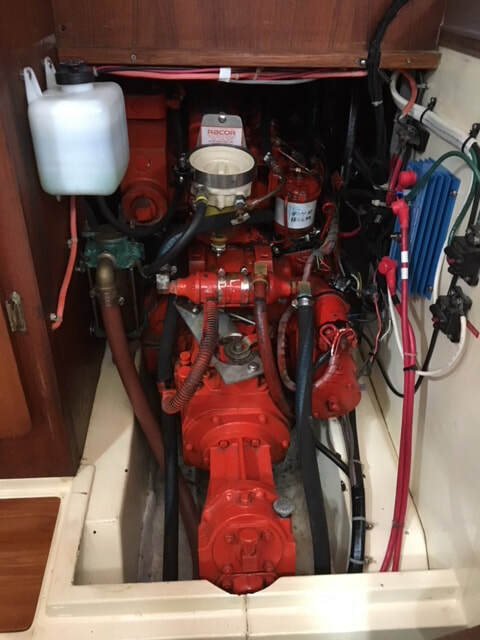 New Yanmar engine 3YM30 2010. New Oceanair RIB Dinghy 2017 with wheels. 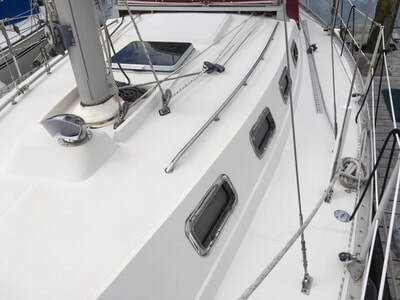 Updated cabin top winches and deck organisers 2018. 2-100 watt Solar Panels on new stainless support 2017. Sails- #1, 2, 3 and Spinnaker. Out of water survey 2017 on request. An .080 oz. ocean blue poly spinnaker with a ATN Suffer and Tacker. Radial corner construction plus it comes with sheets. It is in like-new condition. Used twice on our CS 36T. 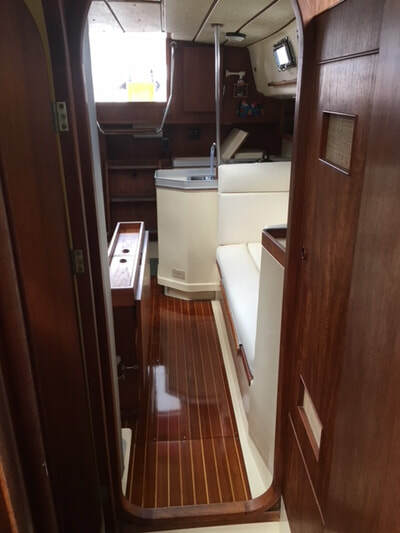 For Sale: Ray Wall designed Quanta 28.5, 1986 sloop. Colour white with red accents. Mast isomat aluminum, boom isomat aluminum. Sails - 2 triradial spinakers with pole, roller furling 3 jibs, mainsail. Windlass installed by Blackline 2014 with 200 ft. of chain. Winches - two primary Harken 40, self tailing, 3 Lumars, 2 winch handles. Electronics - depth and speed. Engine - Yanmar 2 G.M. Serviced yearly by Gartside. Southern Pacific, purchased new 2015, 7’9” with cover. Beautifully designed, easy maintenance and much loved. 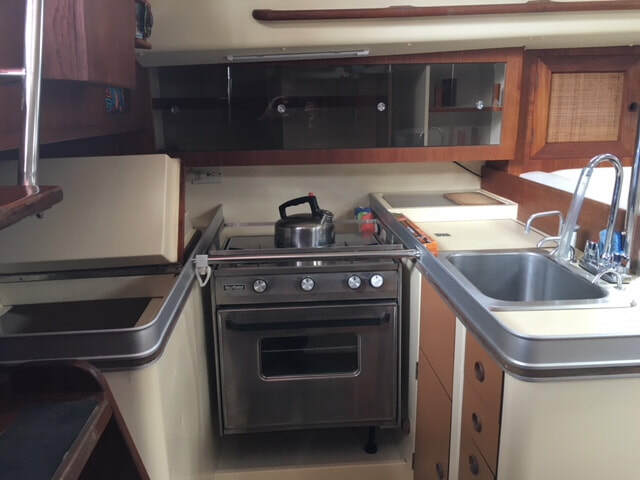 Galley, ice box, three burner stove with oven, clean and efficient. 2015 new electroscan with all pipes replaced. Sink and vanity mirror, with ample storage under sink. 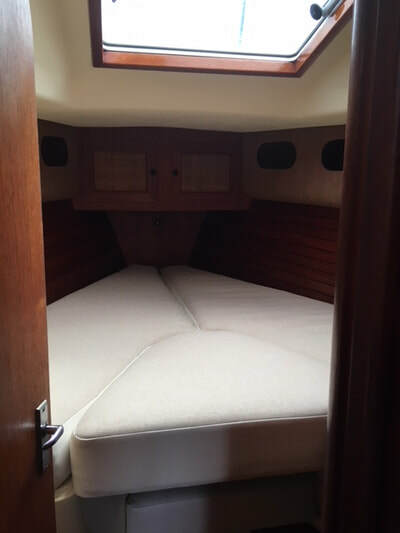 V berth, pipe berth, double bed, and baby cot with canvas side. One large and one small galley table. tools, dishes, boat hook, fish net, etc. "Summer Ours" is currently at the Port of Sidney, B22. With standing headroom this 28 footer is open and airy while maintaining nice lines, traditional layout and wonderful sailing characteristics. Forward is a large V-Berth with storage below and a hanging locker to starboard. The head is aft to port with a vanity and new head. Moving aft into the main salon there is a single settee to starboard and a settee to port that converts to a double. The fold up dinette is mounted on the forward port bulkhead. Aft to starboard is the galley while the large nav station sits to port. 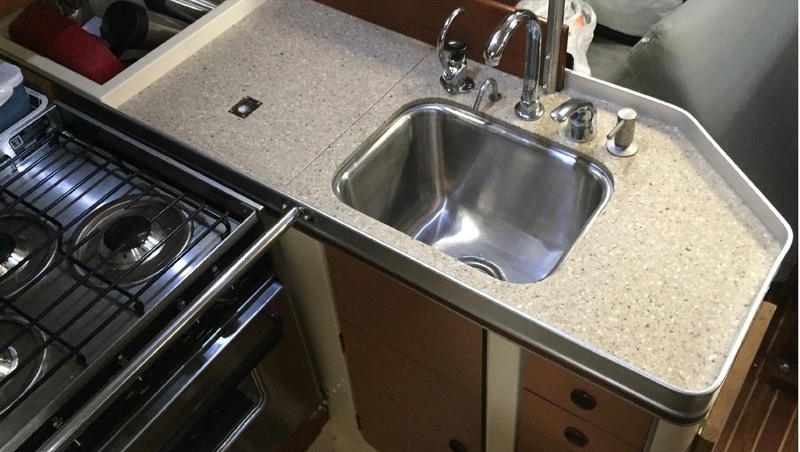 The galley features a Mariner 2 burner propane stove and oven, ice box and stainess steel sink. and abundant storage. Garmin 840xs GPS and chartplotter and Radar. Click the "Download File" button below to read the complete specs and more photos of Wind Dancer. Click the "Download File" to read the complete specs. 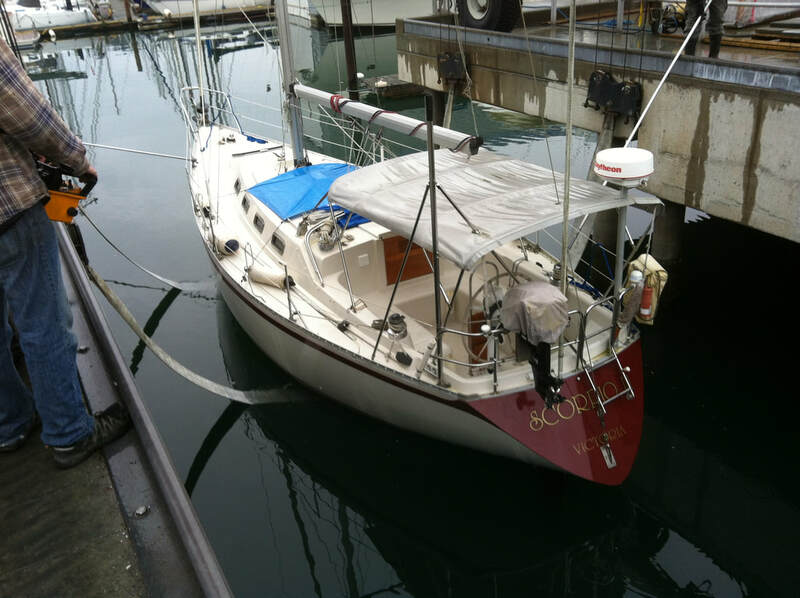 Slip Stream II is a 1981 CS36t that the last survey labelled as “receiving superior standards of maintenance and care”. 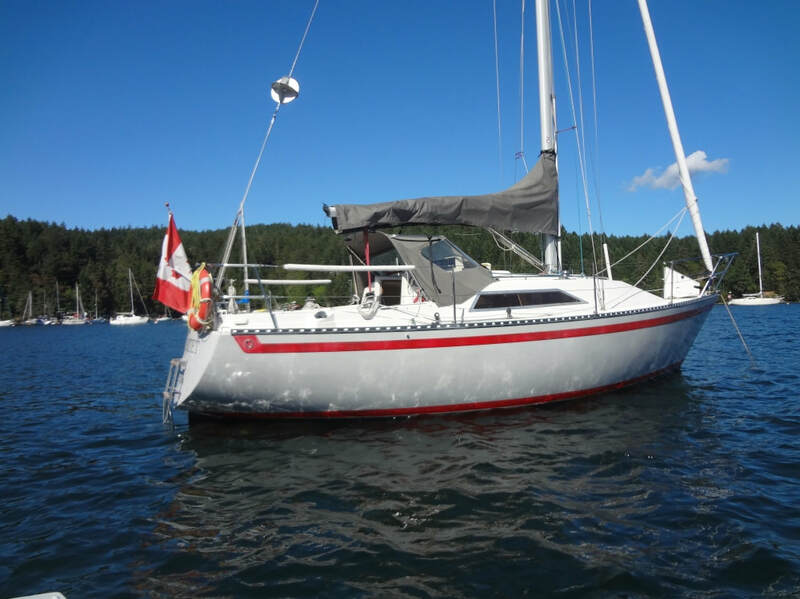 This is a sailboat that truly demonstrates an extensive, quality refit and upgrading from bow to stern. 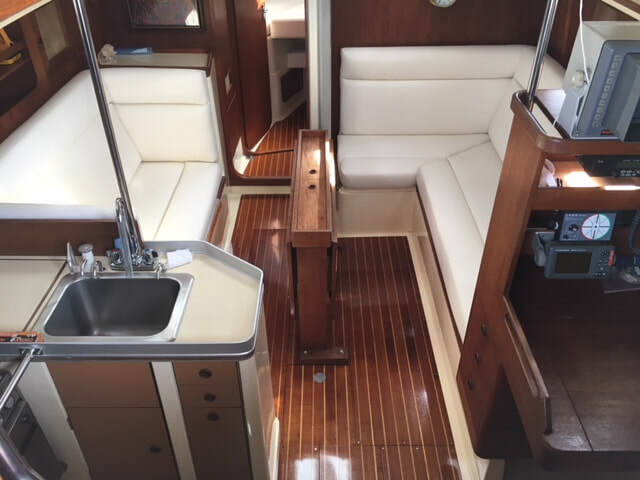 Slip Stream II is ready now for coastal cruising or blue water adventure.! Specifications available. Download the Sales brochure below. -- SOLD -- Click on images to enlarge.